Today’s episode illustrates the importance of not just noticing a pattern of excellence, but working out why it happens. Sometimes this means jumping in and talking to customers. It’s so easy to become disconnected as you become more senior in a company. It seems like the guys at Apple are combating that tendency and putting effort to reconnect their senior leaders with their customers. I was listening to the MacCast podcast this week and the show host, Adam Christianson, shared a story of his friend Tanner who was having trouble getting his iPhone fixed, so in frustration, he emailed Apple CEO Tim Cook (tcook@apple.com). A couple of days later he received a call from Apple, and it was Tim Cook on the line. He wanted to know what happened at each step of Tanner’s support journey and where things fell short of Tanner’s expectations. Cook said he would get his iPhone sorted out. A new one arrived the next day. The story today comes from Leeds, UK but features Brazilian soccer. It gives us insight into what can happen if you first notice aberrations and then put an effort into working out why it’s happening. But don’t stop there. You will only really know if your discovery works when you test it and see if it pans out. This is the essence of innovation. Simon Clifford is a soccer coach from Leeds, UK. In 1997 Simon, as a young man in his early 20s, noticed that many of the best soccer players in the world came from Brazil. And he wondered why that was. So he backed up his bag, borrowed $8000 from friends and family, and headed over to Sau Paulo with notebook and video recorder in hand to find out why. He was there for a year. He saw the obvious things. Passion for the sport. Tradition. Organised training centres. Long training sessions for hours. Desperate poverty people want to get out of. But the thing he felt was the real difference was a game all the kids played called _futabol de saleo_ – football in the room. Played with a smaller and heavier ball. And smaller court – actually could be played just about anywhere. Five a side. So it’s played fast and close relying on great dribbling and passing skills. And because it’s fast on a smaller field, a player would touch the ball about six times more than what they would playing soccer. Kids from 5 years old would play, and in many cases they wouldn’t walk onto a soccer pitch until they were 12 or older but with seven years futebol de salão experience. It’s now commonly called futsal. And when they did step onto the soccer pitch, it was as if the game slowed down and there was so much room to play. An attempt to tackle a futsal player rarely flustered them, it was what they were used to. Up close and personal. Simon is so excited by what he discovered that he returns to Leeds, quits his teaching job, and starts the International Confederation of Futebol de Salão and the Brazilian Soccer School. He trains kids in primary and secondary school. Plays Brazilian music in practice. Lots of futsal practice. The citizens of Leeds think he’s a bit mad. But here’s the thing. In four years Simon’s under 14 Leeds team beats the Scottish U14 national team, and then they beat the Irish U14 squad. His players join the English national team. Leeds becomes a hotspot for UK soccer talent. And I’m Mark Schenk. And Shawn, what’s our story for this week? This is about a soccer coach, a guy called, Simon Clifford. He was a soccer coach in Leeds in the U.K. and Simon noticed something about the great talents of the world: that a lot of them came from Brazil. Soccer talents–absolutely. Some of the great players, from Pele onwards, just one soccer great after another came from Brazil. Instead of just noting that as an interesting fact, he, at the age of 27, packed up his bags, borrowed $8,000 from friends and family. So $8,000 was a fair bit? Yeah, it was. So, he grabbed his video recorder, notebook and went to São Paulo, the great city in Brazil and spent a year just trying to work out why there was this hotbed of talent in Brazil. He immediately saw the obvious things; the passion for the sport, the tradition but he also started to notice other things such as they had very organised training centres. They were really putting effort into their soccer ability; phenomenally long practice sessions—hours and hours. 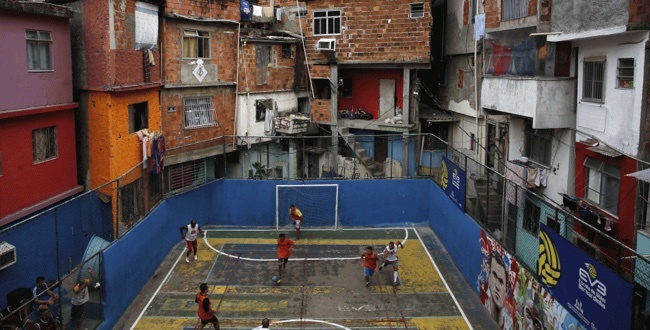 And overlaying everything was the desperate poverty in Brazil; people wanted to get out of it. They’d see people like Ronaldo and they’d want to get a life like that. So, soccer is my ticket out of poverty? Definitely. Simon thought all these things could make a difference but the thing that really blew him away was a little game that he saw so many of the players play—not soccer but a game they called futebol de salão. You say that very well. I don’t know that I do but futebol de salão really means soccer in the room. It’s played with a smaller, heavier ball and it’s played in a small court around half the size of a basketball court. Instead of having 11 players on the field you only have 5 players and it’s a really close up and personal, very fast kind of game. Because it’s so fast and there’s lots of passing, dribbling and ball handling skills they’re touching the ball around 6 times more than you would if you were playing soccer. So, not just practicing for long periods of time but really high value, high impact? Exactly, so repetition was coming through. Kids as young as 5 would start playing this game. From 5 to 12 many didn’t play soccer, they just played what we now call futsal. And then they move to soccer and when they moved to soccer something amazing happens. All of a sudden the field is so big and then the game slows down for them it’s like a walk in the park. So it seems like they have so much time on the field? And when a player comes to tackle them it’s not a problem for them, they don’t have to kick it away very quickly or kick it up the field. They had the skills to dribble it around or do short passes or whatever was required. You can tell, apparently, someone who has had a futsal background compared to someone who hasn’t—just in their confidence in their dribbling skills. Simon sees this and goes, ‘oh my god, this is it’. So, he goes back to Leeds and in a gutsy move resigns from his teaching job and starts, first of all the International Confederation of Futebol de Salão—going for the impressive title. And at the same time he creates a new soccer school—a Brazilian soccer school he called it. And it was focused primarily on primary school to high school kids; he developed this training programme for them. You can imagine, there in Leeds he’s getting these kids to play futsal. He’s trying to get into the whole feel of it so he’s playing Brazilian music on his ghetto blaster, trying to get everyone in the mood. And the citizens of Leeds are just looking at him like he’s crazy; what is this mad guy doing? He kept pushing, pushing—four years later his Leeds under 14’s team beat the Scottish national under 14’s team. Then they go and beat the Irish under 14s team. I bet the people of Leeds weren’t calling him crazy then. Exactly, and I bet the Irish and Scottish weren’t too happy about it. But it went further than that; some of his players got into the English national team. Now he’s created a hotbed of soccer talent. He grows his soccer training schools, from that one little centre he’s now in 12 countries just from that one observation back in ’97 he sees something going on and has the guts to bring it back to Leeds, try it out and have this phenomenal turnaround. That’s real innovation. He saw something he wanted to understand why and he found out. Exactly. So that’s my story for this week. So what do you reckon? What are the things for you that jump out in that story that you like or work well? One of the things I like is he just up-stumps and headed over to Brazil. I kind of wonder if there weren’t other motives for going to Brazil, like the weather for example. Yes, there are probably lots of motives to go to Brazil for a year when you’re 27. But that was kind of surprising that he would up-stumps and go to Brazil for a year in pursuit of this understanding. I think that’s a key point because most people see a pattern of behaviour and they go, ‘oh that’s interesting’ or ‘I wonder why those Brazilians are so good’ and that’s the end of it. So he went ‘I wonder why—I’m going to find out’. That’s the essence of the bright spot strategy isn’t it? You actually have to get your arse off the chair and go to the place where the action is happening. How many times have you seen people trying to work out what to do next just by sitting at their computers in their office wondering what’s going on in the frontline of their organisation? So you’ve got to get out from behind the command console and go out into the real world and find out what’s going on because when you’re sitting at your desk it’s very hard to see behaviours. Whereas when you’re standing in the ghetto in São Paulo and you’re seeing hundreds of kids playing futsal you can see the behaviour; it’s right in your face. Yeah, absolutely. The other thing for me is I love stories that have a wide potential audience. You think how many people immediately understand the concept of soccer. It may not go so well in the U.S but apart from that the rest of the world is playing this game that people know and love. So, you share that story and it resonates straight away; it makes sense to them. I like the fact that people can associate with it, it’s easy to picture, most people can imagine what size a soccer ball is. When you say it’s smaller and heavier than a soccer ball it immediately makes sense. Now, I know there are some people listening for whom that isn’t immediately obvious but for the majority of people it probably is. So any other things we like or that could perhaps make the story even better? What jumps out for you? Some names could make the story better perhaps. Are there any names that went through the Leeds International Federation of Futebol de Salão who are now household names? For example, England played very well in the recent World Cup. Did they benefit from a futsal capability? I actually learnt this story from a book called ‘The Talent Code’ and it’s written by Daniel Coyle and he did mention a name but it didn’t stick in my mind. He also mentioned quite a lot of the names of Brazilian soccer stars. Of course, I remember Pele, Ronaldo but there were a whole lot of other names that if I could remember them and it would make more sense to me if I was more of a soccer person—that would be an even better story. You’d probably be better at remembering the names of all those basketballers. Indeed, that would be a totally different thing. Where would we use this story? Everyone’s talking about innovation and one of the things that story illustrates is that this innovation of futsal came from identifying something that’s being done in one place and transplanting it successfully in another place. And that didn’t happen in the office. And I think the precursor to that is where Simon asks in his mind, ‘why is that happening?’ And rather than just letting it slide he goes out and finds out. And putting that into a practical approach that bright spot approach of actually going out and looking at the behaviours. Now, there’s no guarantee of course that what he saw was the actual answer. He sees futsal and goes, ‘that’s it’. He could easily have brought that back for it to fail. But he experimented. And that’s the other element of innovation. Yes, you can see a pattern of behaviour, which you think might be beneficial but then he did an experiment. His first experiment would have been relatively small, in Leeds, in the local suburban competition but he obviously had some successes. But he built and the next thing you know the big breakthrough has happened. I like that. And it reminds me of the importance of persistence. He conducted his experiment; started his little school in Leeds but it took four years before there was a big breakthrough, big, tangible results. We often see people who have great ideas and give up before the idea matures, so three feet from gold you give up and throw the idea out. I like the importance of persistence that that shows. So, imagine if you’re a leader talking about innovation, rather than just talking about it in general terms you tell this story and then you get people in the organisation to talk about what’s significant in it and get them to understand what might be buried in that. But probably more importantly getting them to find stories in their organisation which are similar. And also to ask them how can we do this sort of thing? What are the sort of problems or opportunities that we are seeing or the questions that we’re facing that we think we can understand more and benefit our business? That story could trigger those very useful conversations. O.K. I think it’s time to give our story a bit of a rating. I told the story so what do you think? Again we assess the story not just on how good the story is but how useable it is. I really like the story, it has good application, I’m going to give it a 6. A 6? It seems pretty low for the application and the story and you still give it a 6. What’s going on there? Do I have to rationalise and justify? I’m happy to. Simply because the utility, the application of the story is clear but limited. For me I’ll give it an 8 because I know I can tell this story. I’ve told it probably three times since I read the book. And the thing about it is the response I get. I have people responding to the story and I can see their eyes light up and how it triggers other things for them so I would keep telling this story. It’s got an element of entertainment about it. A good story does anyway so I’m giving it an 8. So, anything we have to share with our listeners about what’s going on in Anecdote at the moment, any news we want to get out there? One of the things will be I’ll be in Madrid for a week in September running a public workshop on the 5th of September in Madrid, in English by the way. I can’t even say, ‘sorry’ in Spanish. If you are in Europe and interested in attending one of our workshops—5th of September in Madrid. What else? IABC is running a big conference in Melbourne in a few weeks’ time called the Fusion Conference for communicators from Asia/ Pacific and I’m giving a keynote talk at that conference so check it out. If you look under IABC, Fusion, and Melbourne you’ll see the full breadth of things that are going on there. What are you talking on? What’s the topic? I’m talking about strategy stories. Last year I gave a talk at IABC in their World Conference in Washington DC and it was very well received. They’ve asked me to a new version of that for 2018 so really looking forward to that, it’s going to be great fun. Right guys, thanks again for listening to Anecdotally Speaking. Jump in and provide your feedback, your ratings; it helps people find this podcast so other people can learn more stories. We want to build our repertoire. So tune in next time for our next episode of how we can all put stories to work. Until then.